The text of a telegram in 1956 sent by OSS operative Ivar Felix Bryce to his friend Ian Fleming. 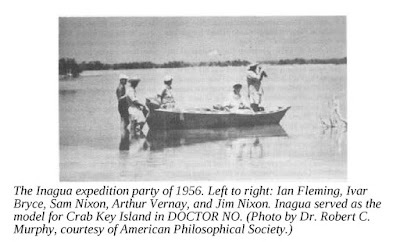 Fleming joined Arthur Vernay to the remote island of Inagua where the silence of the vast sea would inspire Crab Key, the base of his villain Dr No and Fleming used Bryce's middle-name Felix for his CIA operative. Photographs of the group by the ornithologist Robert Cushman Murphy survive in archives. James Bond, of course, was named after the ornithologist who wrote the Birds of the West Indies. 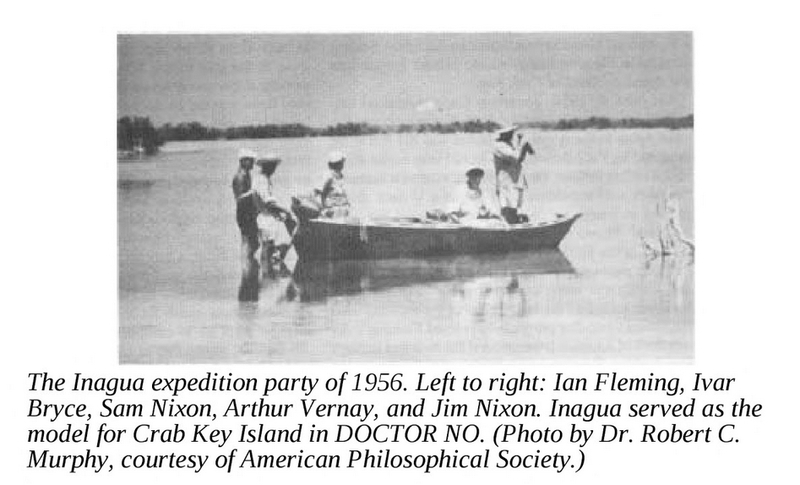 Arthur Vernay had then retired to Nassau and was involved in flamingo conservation in the Bahamas in 1956. Surprisingly, he had never been interested in birds or wildlife until 1921. He had moved from England to New York, and starting as an elevator operator began an antique store and rose to wealth and power - an unbelievable rags to riches story. His interest in the wild was rather surprisingly sparked off by a visit to the Biligirirangan Hills, to the estate of R.C. Morris in 1921. Morris, in an obituary, notes that Vernay had never seen wild animals in their habitat before and that he left very impressed. Impressed enough to begin a series of expeditions the next year into India which was followed by more. It appears that Vernay got in touch with Morris via J.C. Faunthorpe, A BNHS member and big-game hunter who worked briefly with the British mission in the United States. 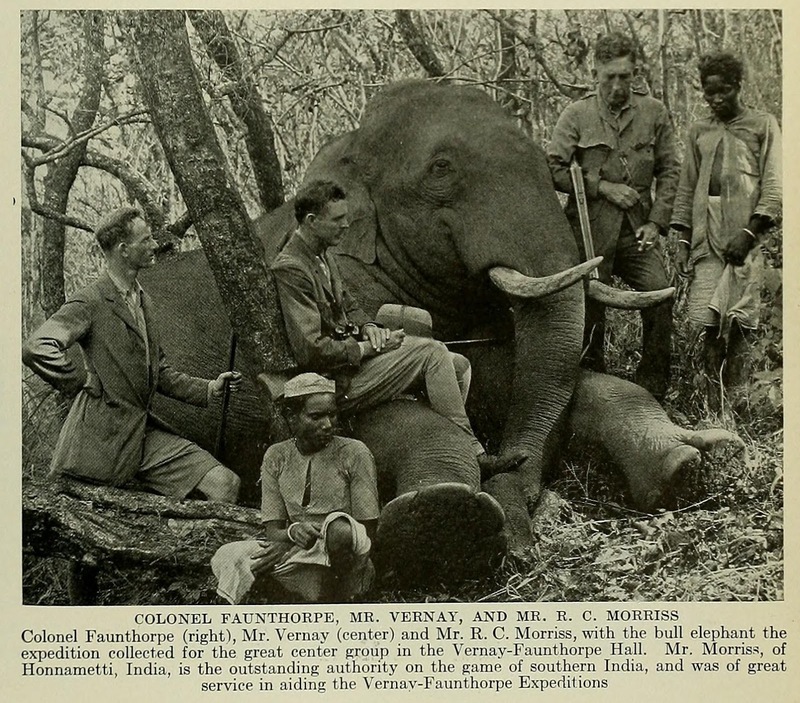 When Vernay made his first trip to India with Faunthorpe, he again visited the Biligirirangans. 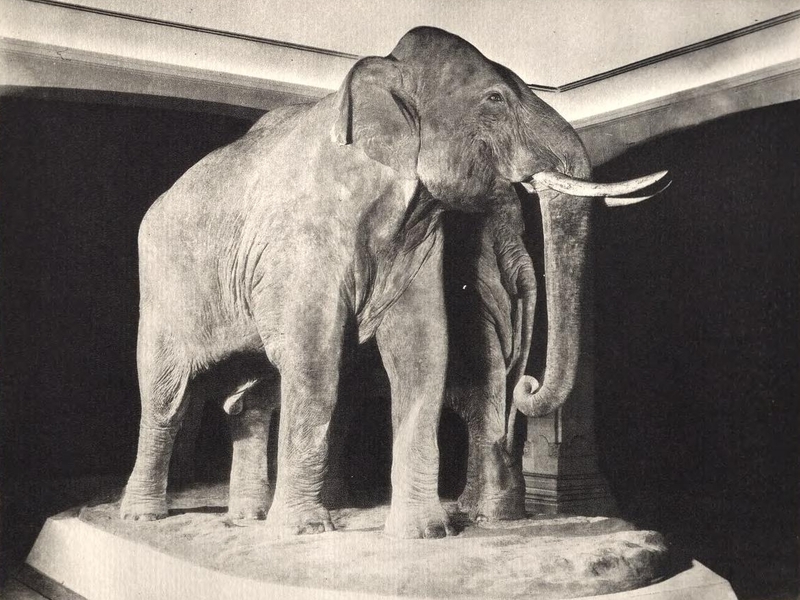 They shot elephants - later exhibited in the Vernay-Faunthorpe Hall of the AMNH. Jonas, Louis. 1930. The mounting of an elephant group. Proceedings of the American Association of Museums, New Series, no. 11, Washington, DC. Vernay would later fund in entirety, a survey of the Eastern Ghats. In those days a survey meant making collections of plants, and animals along the way, shooting, skinning, bottling, and otherwise preserving specimens that would then be examined by experts. The team that went into the field consisted of trained collectors armed with guns, and the ability to prepare specimens with labels. In the Eastern Ghats, the collectors were N.A. Baptista (a Goan skinner in the BNHS) and V.S. LaPersonne (an assistant curator at the BNHS) about whom little is known. Vernay became a trustee at the American Museum of Natural History in 1935 and a Vice Patron of the Bombay Natural History Society in 1928. Through his travels, he sent specimens, mostly to the former but some to the latter too. 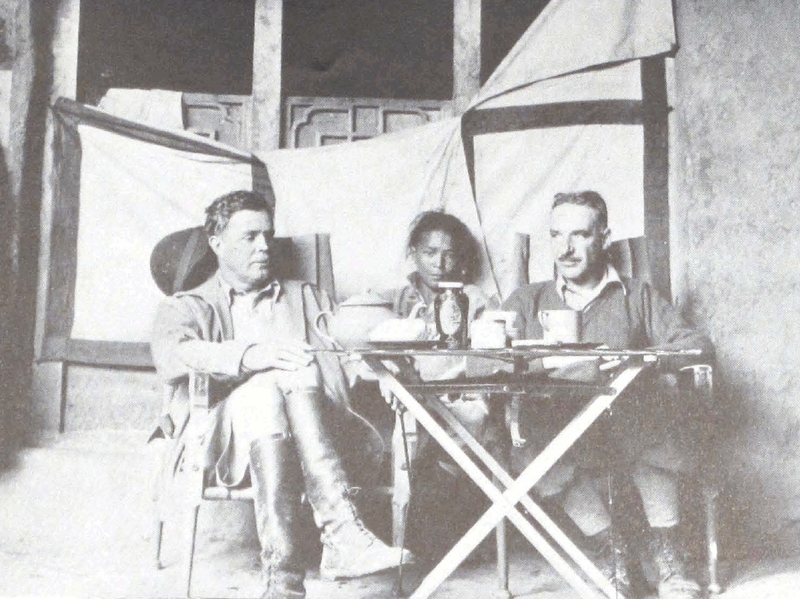 Morris joined the Vernay-Hopwood Upper Chindwin Expedition of 1935. There are pictures of him in the archives of H.C. Raven. Major Guy Rowley, Arthur S.
Here is a view of Morris' home in the Biligiris, Attikan from 2019. And a view from Honnematti rock beside the hill on which their estate stands. A diorama in the Vernay-Faunthorpe Hall - probably inspired by a scene from the Biligirirangans. Vernay went on several other expeditions, one with another wealthy explorer Charles Suydam Cutting. The Vernay-Cutting expedition was aided by British intelligence officer and amateur botanist F.M. Bailey. In Africa, he was joined by another ornithologist who also worked as an OSS operative - Rudyerd Boulton. Another photo in the Smithsonian Archives shows them in Lhasa with a Lhasa Apso at their feet. Cutting would introduce Lhasa Apsos into the United States. He gifted dachshunds to the Dalai Lama in return. While all these images capture the age of expeditions and unknown frontiers, one wonders if modern field biologists sometimes, and in vain, try and relive the same. Worse still, are conservation projects, funded by wealthy corporates, utilized to post so-called experts into wilderness areas where the local people themselves are treated the way the so-called "natives" were in colonial times. Wildlife movies often dwell on the romance of travel - showing how the wildernesses were reached by helicopters, 4-wheel drives and by hacking their way through jungle and gloss over the fact that people live right near those locations without much ado. With government funding drying up in many science fields, will biologists go to the billionaires again? —I suppose you are an entomologist?—I said with a note of interrogation. —Not quite so ambitious as that, sir. I should like to put my eyes on the individual entitled to that name! A society may call itself an Entomological Society, but the man who arrogates such a broad title as that to himself, in the present state of science, is a pretender, sir, a dilettante, an impostor! No man can be truly called an entomologist, sir; the subject is too vast for any single human intelligence to grasp. The Poet at the Breakfast Table (1872) by Oliver Wendell Holmes, Sr. 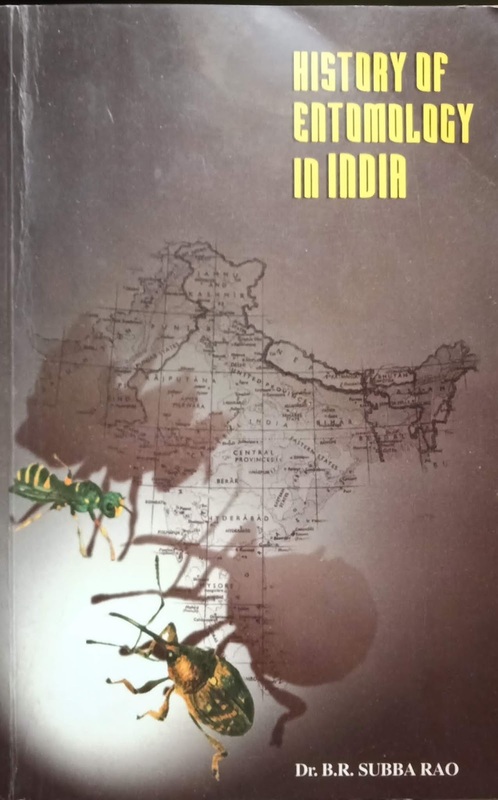 The history of interest in Indian insects has been approached by many writers and there are several bits and pieces available in journals and there are various insights distributed across books. There are numerous ways of looking at how people historically viewed insects. One attempt is a collection of biographies, some of which are uncited verbatim (and not even within quotation marks) accounts from obituaries, by B.R. Subba Rao who also provides something of a historical thread connecting the biographies. Keeping Indian expectations in view, Subba Rao and M.A. Husain play to the crowd. Husain was writing in pre-Independence times where there was a genuine conflict between Indian intellectuals and their colonial masters. They begin with interpretations of mentions of insects in old Indian writings. As can be expected there are mentions of honey, shellac, bees, ants, and a few nuisance insects in old texts. Husain takes the fact that the term Satpada षट्पद or six-legs existed in the 1st century Amarakosa to suggest that Indians were far ahead of time because Latreille's Hexapoda, the supposed analogy, was proposed only in 1825. Such histories gloss over the structures on which science and one can only assume that they failed to find the development of such structures in the ancient texts that they examined. The identification of species mentioned in old texts are often based on ambiguous translations should leave one wondering what the value of claiming Indian priority in identifying a few insects is. For instance K.N. Dave translates a verse from the Atharva-veda and suggests an early date for knowledge of shellac. This interpretation looks dubious and sure enough, Dave has been critiqued by Mahdihassan. The indragopa (Indra's cowherd) is supposedly something that appears after the rains. Sanskrit scholars have identified it variously as the cochineal insect (the species Dactylopius coccus is South American! ), the lac insect, a firefly(!) and as Trombidium (red velvet mite) - the last matches the blood red colour mentioned in a text attributed to Susrutha. To be fair, ambiguities resulting from translation are not limited to those that deal with Indian writing. Dikairon (Δικαιρον), supposedly a highly-valued and potent poison from India was mentioned in the work Indika by Ctesias 398 - 397 BC. One writer said it was the droppings of a bird. Valentine Ball thought it was derived from a scarab beetle. Jeffrey Lockwood claimed that it came from the rove beetles Paederus sp. And finally a Spanish scholar states that all this was a misunderstanding and that Dikairon was not a poison, and believe it or not, was a masticated mix of betel leaves, arecanut, and lime! One gets a far more reliable idea of ancient knowledge and traditions from practitioners, forest dwellers, the traditional honey harvesting tribes, and similar people that have been gathering materials such as shellac and beeswax. Unfortunately, many of these traditions and their practitioners are threatened by modern laws, economics, and culture. These practitioners are being driven out of the forests where they live, and their knowledge was hardly ever captured in writing. The writers of the ancient Sanskrit texts were probably associated with temple-towns and other semi-urban clusters and it seems like the knowledge of forest dwellers was not considered merit-worthy. A more meaningful overview of entomology may be gained by reading and synthesizing a large number of historical bits, of which there are a growing number. The 1973 book published by the Annual Reviews Inc. should be of some interest. 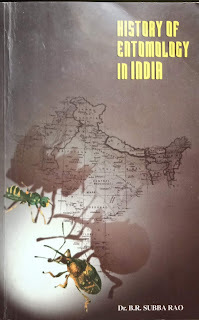 I have appended a selection of sources that I have found useful in adding bits and pieces to form a historic view of entomology in India. It helps however to have a broader skeleton on which to attach these bits and minutiae. Here, there area also truly verbose and terminology-filled systems developed by historians of science (for example, see ANT). I prefer an approach that is free of a jargon overload and like to look at entomology and its growth along three lines of action - cataloguing with the main product being collection of artefacts and the assignment of names, communication and vocabulary-building are social actions involving groups of interested people who work together with the products being scholarly societies and journals, and pattern-finding where hypotheses are made, and predictions tested. I like to think that anyone learning entomology also goes through these activities, often in this sequence. With professionalization there appears to be a need for people to step faster and faster into the pattern-finding way which also means that less time is spent on the other two streams of activity. The fast stepping often is achieved by having comprehensive texts, keys, identification guides and manuals. The skills involved in the production of those works - ways to prepare specimens, observe, illustrate, or describe are often not captured by the books themselves. The cataloguing phase of knowledge gathering, especially of the (larger and more conspicuous) insect species of India grew rapidly thanks to the craze for natural history cabinets of the wealthy (made socially meritorious by the idea that appreciating the works of the Creator was as good as attending church) in Britain and Europe and their ability to tap into networks of collectors working within the colonial enterprise. The cataloguing phase can be divided into the non-scientific cabinet-of-curiosity style especially followed before Darwin and the more scientific forms. The idea that insects could be preserved by drying and kept for reference by pinning, [See Barnard 2018] the system of binomial names, the idea of designating type specimens that could be inspected by anyone describing new species, the system of priority in assigning names were some of the innovations and cultural rules created to aid cataloguing. These rules were enforced by scholarly societies, their members (which would later lead to such things as codes of nomenclature suggested by rule makers like Strickland, now dealt with by committees that oversee the ICZN Code) and their journals. It would be wrong to assume that the cataloguing phase is purely historic and no longer needed. It is a phase that is constantly involved in the creation of new knowledge. Labels, catalogues, and referencing whether in science or librarianship are essential for all subsequent work to be discovered and are essential to science based on building on the work of others, climbing the shoulders of giants to see further. Cataloguing was probably what the physicists derided as "stamp-collecting". The other phase involves social activities, the creation of specialist language, groups, and "culture". The methods and tools adopted by specialists also helps in producing associations and the identification of boundaries that could spawn new associations. The formation of groups of people based on interests is something that ethnographers and sociologists have examined in the context of science. Textbooks, taxonomic monographs, and major syntheses also help in building community - they make it possible for new entrants to rapidly move on to joining the earlier formed groups of experts. Whereas some of the early learned societies were spawned by people with wealth and leisure, some of the later societies have had other economic forces in their support. Like species, interest groups too specialize and split to cover more specific niches, such as those that deal with applied areas such as agriculture, medicine, veterinary science and forensics. There can also be interest in behaviour, and evolution which, though having applications, are often do not find economic support. The pattern finding phase when reached allows a field to become professional - with paid services offered by practitioners. It is the phase in which science flexes its muscle, specialists gain social status, and are able to make livelihoods out of their interest. Lefroy (1904) cites economic entomology as starting with E.C. Cotes [Cotes' career in entomology was short, after marrying the famous Canadian journalist Sara Duncan in 1889 he too moved to writing] in the Indian Museum in 1888. But he surprisingly does not mention any earlier attempts, and one finds that Edward Balfour, that encyclopaedic-surgeon of Madras collated a list of insect pests in 1887 and drew inspiration from Eleanor Ormerod who hints at the idea of getting government support, noting that it would cost very little given that she herself worked with no remuneration to provide a service for agriculture in England. Her letters were also forwarded to the Secretary of State for India and it is quite possible that Cotes' appointment was a result. As can be imagined, economics, society, and the way science is supported - royal patronage, family, state, "free markets", crowd-sourcing, or mixes of these - impact the way an individual or a field progresses. Entomology was among the first fields of zoology that managed to gain economic value with the possibility of paid employment. David Lack, who later became an influential ornithologist, was wisely guided by his father to pursue entomology as it was the only field of zoology where jobs existed. Lack however found his apprenticeship (in Germany, 1929!) involving pinning specimens "extremely boring". Though I deal with it last it is the first in importance. Under it has to be included all the work done by individuals who are not in Government employment or who being government servants devote their leisure hours to science. A number of missionaries come under this category. They have done considerable work mainly in the natural sciences. There are also medical men who devote their leisure hours to science. The discovery of the transmission of malaria was made not during the course of Government work. These men have not received much encouragement for research or reward for research, but they deserve the highest praise., European officials in other walks of life have made signal contributions to science. 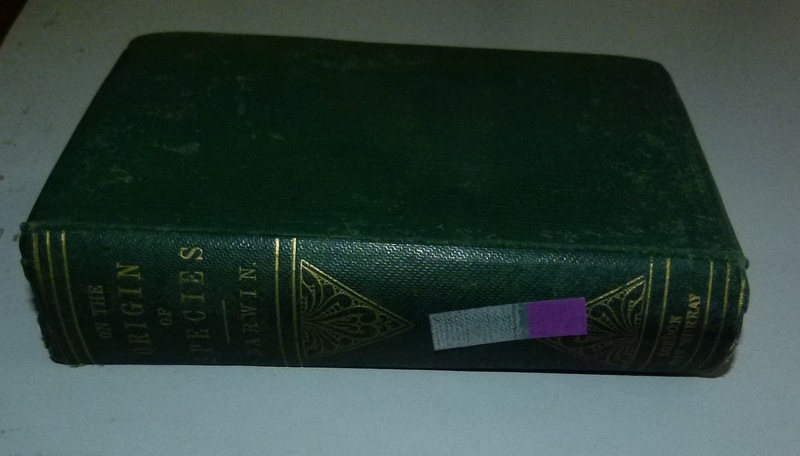 The fascinating volumes of E. H. Aitken and Douglas Dewar are the result of observations made in the field of natural history in the course of official duties. Men like these have formed themselves into an association, and a journal is published by the Bombay Natural History Association[sic], in which valuable observations are recorded from time to time. That publication has been running for over a quarter of a century, and its volumes are a mine of interesting information with regard to the natural history of India. This then is a brief survey of the work done in India. As you will see it is very little, regard being had to the extent of the country and the size of her population. I have tried to explain why Indians' contribution is as yet so little, how education has been defective and how opportunities have been few. Men do not go after scientific research when reward is so little and facilities so few. But there are those who will say that science must be pursued for its own sake. That view is narrow and does not take into account the origin and course of scientific research. Men began to pursue science for the sake of material progress. The Arab alchemists started chemistry in the hope of discovering a method of making gold. So it has been all along and even now in the 20th century the cry is often heard that scientific research is pursued with too little regard for its immediate usefulness to man. The passion for science for its own sake has developed largely as a result of the enormous growth of each of the sciences beyond the grasp of individual minds so that a division between pure and applied science has become necessary. The charge therefore that Indians have failed to pursue science for its own sake is not justified. Science flourishes where the application of its results makes possible the advancement of the individual and the community as a whole. It requires a leisured class free from anxieties of obtaining livelihood or capable of appreciating the value of scientific work. Such a class does not exist in India. The leisured classes in India are not yet educated sufficiently to honour scientific men. Kunhikannan may be among the few Indian scientists who dabbled in cultural history, and political theorizing. He wrote two rather interesting books The West (1927) and A Civilization at Bay (1931, posthumously published) which defended Indian cultural norms while also suggesting areas for reform. While reading these works one has to remind oneself that he was working under and with Europeans and would not have been able to have many conversations on these topics with Indians. An anonymous writer who penned the memoir of his life in his posthumous work notes that he was reserved and had only a small number of people to talk to outside of his professional work. Balfour, Edward (1887). The agricultural pests of India, and of eastern and southern Asia, vegetable and animal, injurious to man and his products. London: Bernard Quaritch. Barnard, Peter C. (2018). Bat-Fowlers, Pooters and Cyanide Jars: a Historical Overview of Insect Collecting and Preservation in MacGregor, A. (Ed.). Naturalists in the Field . Brill. Farber, P.L. (1976). The type-concept in zoology during the first half of the nineteenth century. Journal of the History of Biology 9(1):93–119. Hewitt, C. Gordon (1916). A review of applied entomology in the British Empire. Annals of the Entomological Society of America. 9(1):1–33. Howard, L.O. (1930). A history of applied entomology (Somewhat Anecdotal). Smithsonian Institution. Publication 3065. Lefroy, Maxwell (1904). Historical summary in Report of the Entomologist to the Government of India. Lienhard, S. (1978) On the meaning and use of the word indragopa. Indologica Taurinensia 6:177-188. Lockwood, J.A. (2012) Insects as weapons of war, terror, and torture. Annual Review of Entomology 57:205-227. Mahdihassan, S. (1986). Lac and its decolourization by orpiment as traced to Babylon. Indian Journal of History of Science 21(2):187-192. 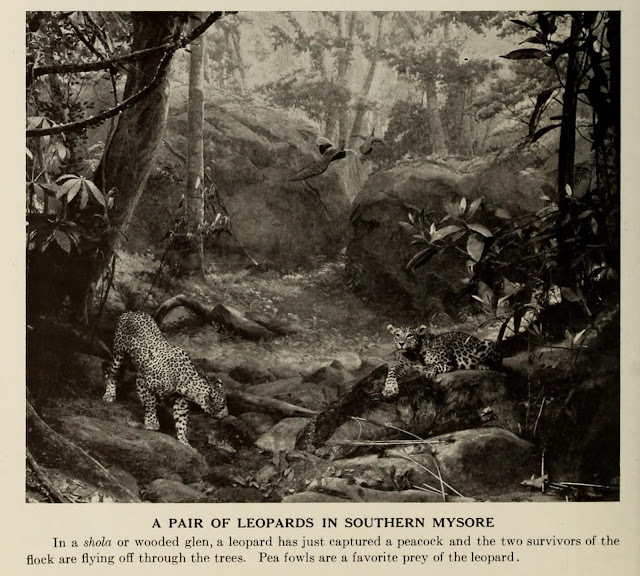 Rao, H. Srinivasa (1957) History of our knowledge of the Indian fauna through the ages. Journal of the Bombay Natural History Society 54:251-280. Rao, B.R. Subba (1983). Systematic entomology in India - past, present and future. Current Science 52(21):997-1000. Romero, D.B. (2007). El díkairon en la obra Indika de Ctesias de Cnido. Propuesta de identificación. Emerita 75(2):255-272. Smith, Ray F.; Mittler, T.E. 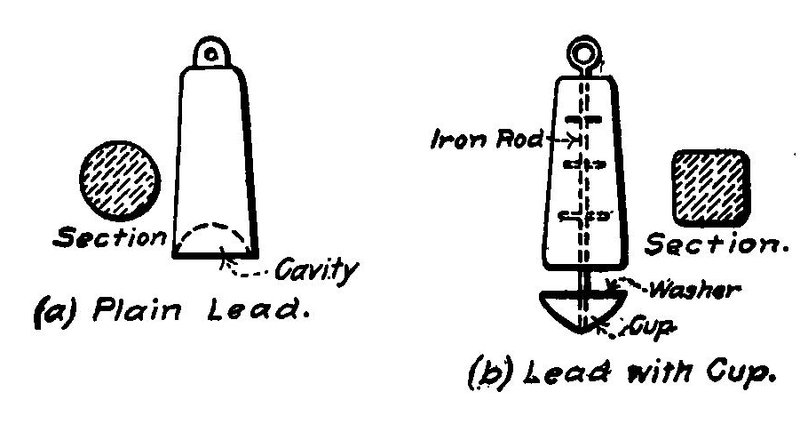 ; Smith, Carroll N. (1973). History of Entomology. Annual Reviews Inc. ISBN 0824321017. PS: Thanks to Prof C.A. Viraktamath, I became aware of a new book- Gunathilagaraj, K.; Chitra, N.; Kuttalam, S.; Ramaraju, K. (2018). Dr. T.V. Ramakrishna Ayyar: The Entomologist. Coimbatore: Tamil Nadu Agricultural University. - this suggests that TVRA went to Stanford on the suggestion of Kunhikannan. Among the many amazing stories from India that went into the pages of science is that of Sindri fort. It is hardly mentioned in India anymore but it was of interest to Charles Lyell and whose work was significant also for Charles Darwin. This fort sank along with a large area around it on 16 January 1819 around 6.45 PM when the region was struck by an earthquake that also caused a tsunami. While this region sank, the northern edges a few kilometers away rose up. It formed a feature that was named as Allah Bund. It apparently became, for a while, a standard textbook example demonstrating a dynamic earth, one that was no longer God's static creation but one where sudden and catastrophic changes could occur. Some years ago, when I learned about the significance of this location in the history of geology and evolutionary thought, I decided that it needed a bit more coverage and began an entry in Wikipedia at Sindri Fort. 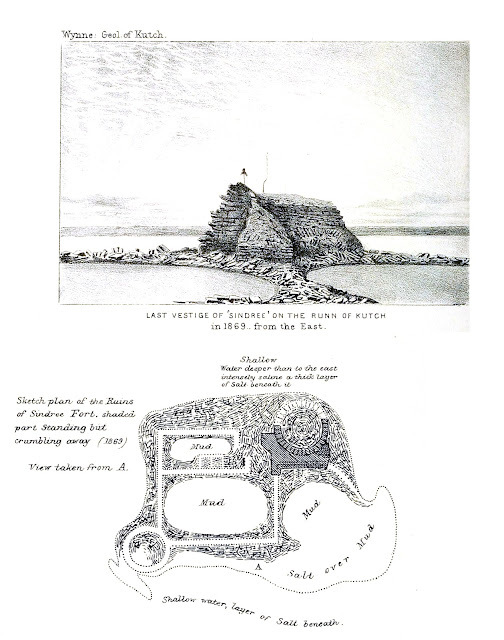 When referring to geographical entities, Wikipedia articles can also be marked by coordinates (so as to show up on maps) but I had a lot of trouble figuring out where this fort stood, and having never been anywhere near Gujarat, I had set it aside after some fruitless searches across the largely featureless Rann of Kutch on Google Earth. Today, I happened to look up the work of a geologist A.B. 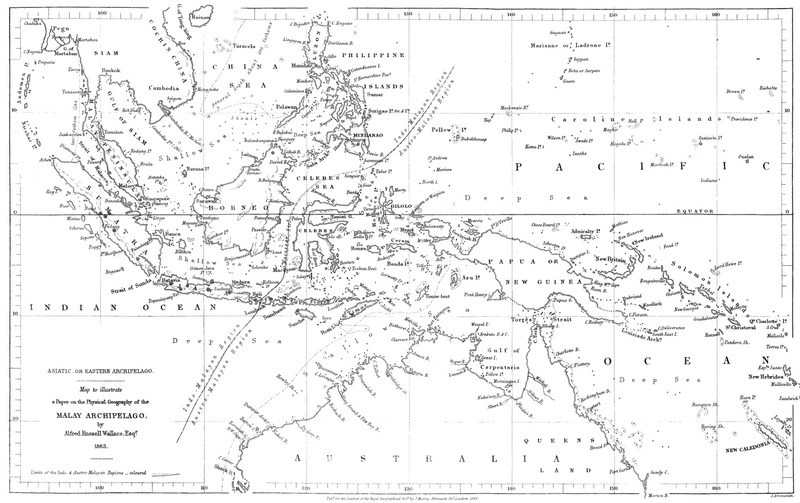 Wynne and found that he had mapped the region in 1869 (along with the very meticulous people from the Survey of India). Fortunately, the Memoirs of the Geological Survey have recently been scanned by the Biodiversity Heritage Library and are readily available online. I downloaded the four map pages and stitched them into one large map which I then uploaded the map to Wikimedia Commons (the shared image repository of Wikipedias in various languages) at https://commons.wikimedia.org/wiki/File:Kutch_geology.jpg and then altered the metadata template from one for information to "map" instead - this then allowed the image to be transferred to the MapWarper (an open-source system) installation at https://warper.wmflabs.org/ - finding a few corresponding points on the old map and the base map allowed me to overlay the image atop Google Earth by exporting a kml file of the alignment. 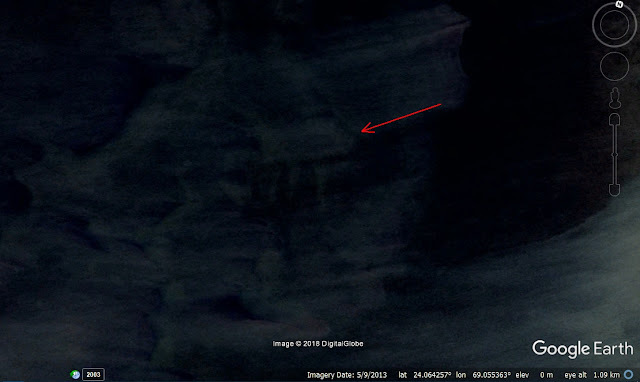 I then looked up Google Earth to see what lay under the location of the ruins of the Sindri Fort indicated on the old map from 1869 and not very far (within a kilometer) from the marked location, lo and behold, there were faint traces of a structure which would be right where Sindri Fort stood. So here it is for anyone interested. It is quite possible that the location is well-known to locals, but it was still quite thrilling that one could work this out from afar thanks to the accessibility of information. It would not have been possible but for a combination of Wikipedia, the Biodiversity Heritage Library, the Internet Archive, Google Earth, the Warper project, and the numerous people behind all these who are working not just as researchers but as research enablers. 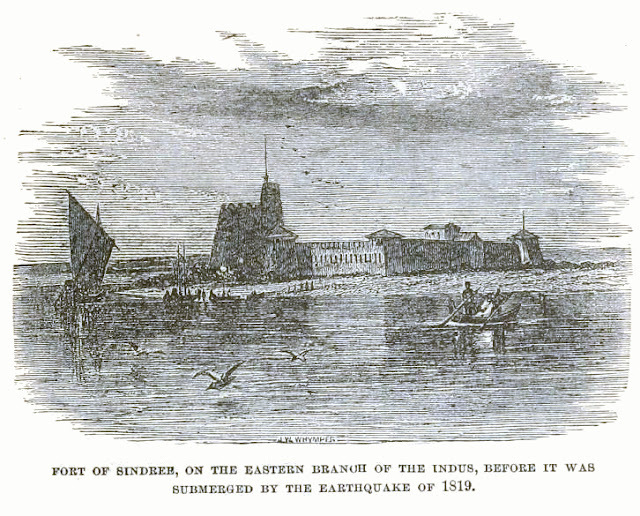 See https://en.wikipedia.org/wiki/Sindri_Fort and the references cited there. After years of editing Wikipedia entries on the biographies of ornithologists, naturalists, and examining topics in Indian natural history, it strikes me that modern scientists do not reflect enough on the history of institutionalized research. Perhaps the growth of unemployment, particularly among the highly educated will have at least one positive effect, by pushing more people to understand why history, economics, politics matters, and more importantly, how being a better citizen matters to science. The trouble with "citizen science" (especially in India) is that it is hard to get scientists to be good citizens. Knowing the land was an obvious requirement for colonial control and the surveys of land through the establishment of the Survey of India began quite early in 1767. Establishing botanical gardens (Calcutta botanical garden at Sibpur founded in 1786), the study of botany, and setting up the Botanical Survey of India (founded in 1890) was also somewhat easy considering the obvious economic value of plants and their produce. Geology, with the importance of coal for shipping and for the railways was also of obvious value and the Geological Survey of India (founded in 1851) was one of the oldest research enterprises in India. The Forest Department was established essentially to manage timber supplies for the massive needs of the railways. Medical research, sanitation and public health was something that became institutionalized thanks to rampant disease. Building scholarly societies, managing communications, creating institutional collections/museums, and printing journals were often initiated by groups of individuals. Government support usually came later, after demonstrating longevity - as with the Asiatic Society of Bengal (founded 1784) (and the Indian Museum established in 1814). Institutions enabled the participation of people from outside the wealthy strata - a notable example in zoology being Edward Blyth although the Indian Museum's primary focus at the time of his recruitment was on antiquities - indeed Blyth lamented that he was "accused" of being an ornithologist! Entomologists managed to make a profession within applied fields relating to health and agriculture but demonstrating the utility of general zoology was hard. The Zoological Survey of India thus was only established in 1916. Their early research clearly indicates a struggle to appear to be utilitarian, with studies on such topics as the damage caused by molluscs to ships or termites to wood. 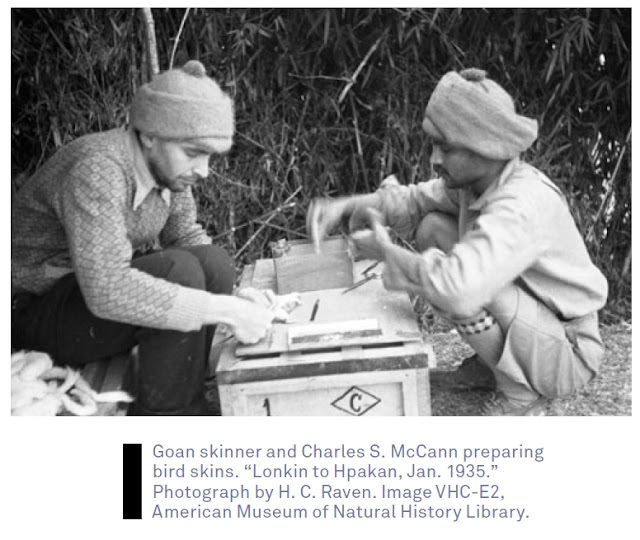 Under these circumstances it seems that early pioneers of bird study in India like Allan Octavian Hume (and older ones like T.C.Jerdon, Hodgson and W.H. Sykes), who knew colonial governance intimately, probably knew that schemes to find monetary support for ornithology would not fly. They knew that they had to rely on their own funds for their hobby. Salim Ali came from a reasonably well-to-do family and was able to make ornithology into a profession for himself, but it definitely was not easy. A document available in the National Archives of India (and happily now available online) shows how a 1934 proposal for economic ornithology, seeking funds from the government, met its end. In his proposal Ali notes "the Bureau of Biological Survey is a branch of the United States Department of Agriculture which employs at great expense a permanent staff of experts to investigate, among other things, the life-histories of birds with special reference to their economic aspect... over many years, a great deal of information has accumulated which is now proving of inestimable value to Agriculture, Forestry and Horticulture, besides being of the greatest importance to pure Science." [underlined emphasis mine] Ali's proposal is fully endorsed and supported by the director of Zoological Survey of India - Baini Prashad. C.G. Trevor of the Forest Research Institute notes that the proposal is restricted in scope to agriculture and that the "entomological branch of the Forest Research Institute has full information on all that has been published on the economic ornithology of India and analysis reveals that it amounts to very little of practical importance." Ali's proposal essentially sought to work along the lines of a 1912 study by Mason and Lefroy which involved the examination of gut contents of birds. This required specialists capable of identifying insects and plant material in the gut and the skills required for this was noted by Trevor as being hard to find. The proposal was also examined by F.J.F. Shaw, the director of the Imperial Institute of Agricultural Research (now Indian Agricultural Research Institute) who forwarded it to the Imperial Entomologist (in 1935 that would have been Hem Singh Pruthi but the document is not signed). Pruthi declares that the principal investigator needs to be an entomologist and generally hints that Salim Ali was unfit to conduct the research. Shaw died of a heat stroke in 1936 and it would be safe to assume that the proposal did not get any further. Ali finally found sponsors for his research through the patronage of the Princely States - which is almost a throwback to medieval times when art and culture could only flourish under royal patronage. In the mid-1960's the ICAR finally began an all-India coordinated research project on birds but it would seem like Ali was not very closely involved. With the growth of aviation and the risk of bird-hits Ali found a new sponsor for bird research. 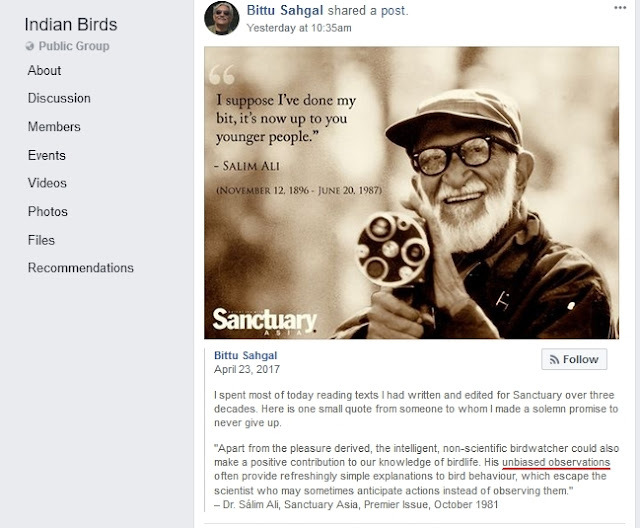 The only socialist / government institution in India to deal specifically with ornithology was/is the Salim Ali Centre for Ornithology and Natural History (SACON) at Coimbatore. But it turns out that establishing institutions is the easier part. Staffing, nurturing long-term research, collaborating, communicating, demonstrating value, and building institutional values that are independent of government and personal tenure are all skills that are undocumented, intangible and ones that Indian academics seem to fail in. Rigid rules for personnel selection, qualifications, and a general lack of vision that does not see a need for a multi-disciplinarity approach ensure that such specialised government-controlled organizations fare badly or are driven into ruts. Most of the Survey institutions were established in colonial times when universities were more for teaching than research. With the growth of universities for research, ornithological research in India did briefly do well but revolving around key personnel and often these research groups dissolved - thus there have been spurts of research on physiology, parasitology, behavioural and ecological study. How much of the funds for these studies came from the tax-payer is hard to establish but one can be safe to assume that it was insignificant as far as funds for research go. With the growth of neo-liberalism - the idea that the free-market will "sensibly" decide what needs to be funded it is clear that research on birds will be further threatened. Indeed it would be hard to discover what good do birds from the point of view of any potential funding industry. When most bird habitats are threatened by industry, the only potential purpose in funding would be for green-washing. Birds and the threats they face through pollution, fragmentation of habitats by roads, railways, logging, fires, human disturbances are definitely not what industrialists would like to learn about or fund. It is in this light that calls for "citizen science", especially from private players but also those run by governments, need to be evaluated more carefully than ever before. Whether citizen science projects can help evaluate the impact of the threats to birds such as fragmentation by roads, rails and other projects is largely undemonstrated (in most cases, the systems and the databases are outright unsuited for carefully tailored data gathering) and yet these are precisely the kinds of issues where government- and industry-funded research cannot be trusted. These are the kinds of issues that ought to be examined by good "nuisance-creating" citizens. Collecting information that directly impinges on ecosystem health cannot be left to people with leisure - indeed people with leisure are probably the ones that distance themselves most from habitats at risk. So who are the powers that are promoting citizen-science and is it really empowering citizens? Food for thought hopefully. The part on utilitarian roots of institutionalized science in India and the problem of doing ornithology in India is largely drawn from the scheme of a talk I gave at the South London Botanical Institute, London on 11 August 2014. A 2017 book looks at how government support altered the field of paleontology. "In the 19th and early 20th centuries, North American and European governments generously funded the discoveries of such famous paleontologists and geologists as Henry de la Beche, William Buckland, Richard Owen, Thomas Hawkins, Edward Drinker Cope, O. C. Marsh, and Charles W. Gilmore. 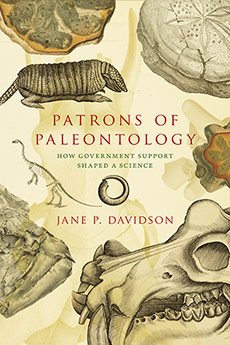 In Patrons of Paleontology, Jane Davidson explores the motivation behind this rush to fund exploration, arguing that eagerness to discover strategic resources like coal deposits was further fueled by patrons who had a genuine passion for paleontology and the fascinating creatures that were being unearthed. These early decades of government support shaped the way the discipline grew, creating practices and enabling discoveries that continue to affect paleontology today." There is nothing very Remarkable between these places, saving the high ridge of land that comes from the Quoining Land, seen on the back of Mangalore, that receives Basallore hill, and trenches northward far into the Country; the Coast is bold all the Way, and your Soundings green Ooze. Pidgeon Island is six Leagues off the Main, and may be seen as far Northward or Southward; the Channel made between is unquestionably good. There is a small naked rock adjoining to this island, where multitudes of Pidgeons breed; I have taken a great many fine Oysters from thence at low Water, but you must carry Scrapers and long spikes to strike them off. The Latitude of Pidgeon Island is in fourteen Degrees five minutes North. On the French national library, there is a fragment of a book The port and prospect in and near the river of Mangalore ; A prospect of the Mulkey rocks ; A prospect of Pidgeon Island published somewhere in the 1700s it is part of a collection belonging to the cartographer d'Anville. Pigeon Island is what is today called Nethrani Island, known to be one of the best and most bio-diverse coral reefs close to mainland India and one that has hardly been carefully examined - mainly because the island is used for target practice by the Indian Navy who bomb it periodically with torpedoes. It is also said to have the world's highest density of nesting White-bellied Sea-eagles. What caught my attention was the information given to navigators - "your Soundings green Ooze." Trying to make sense of this phrase led to an examination of navigation practices in the period. Sounding is a word for finding the depth of the sea-floor and it comes from ancient times, well before sounding actually was done using sound - with sonar, reflecting sounds off the sea floor and calculating the distance based on the time taken for echoes. 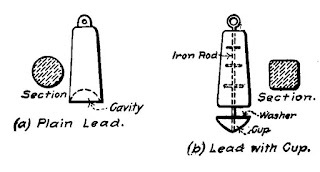 Nautical charts routinely indicate seabed types and this tradition was mainly to examine spots for anchorage and not so much for scientific analysis although they were used as indicators for good fishing and for identifying the nature of currents based on the distribution of silt deposits at the mouths of rivers. With the establishment of marine surveys, a more systematic sampling of sediments was undertaken with a view to find larger scale patterns. Drilled cores of the sea bed in the Arabian Sea allow for examination of the deposition of the ooze over time. One of the patterns is that the ooze deposit is correlated with the Southwest Monsoon. It may be related to the flow of nutrients with rainwater runoff and the resultant growth. The data from these cores have been used as proxies to understand long-term patterns in the monsoon and its strength. For an example of the modern techniques available and what they can reveal - see Schmiedl, G., and D. C. Leuschner (2005). But let's get back to an earlier age. 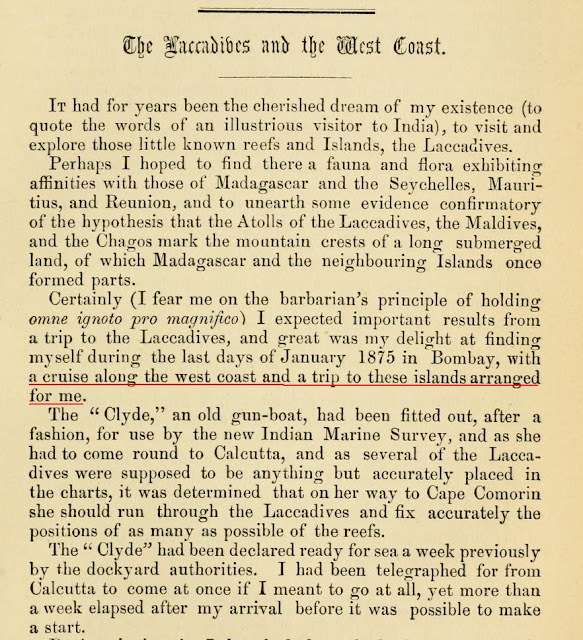 A history of the Indian marine surveys has been written by Clements Markham (but it is worth remembering that he can be unreliable at times - as in his Cinchona history). The first surveys by the navy of the East India Company focused on ports and navigation. The trend was continued until the ending of the "Indian Navy" (not to be confused with the post-Independence organization) in 1862. 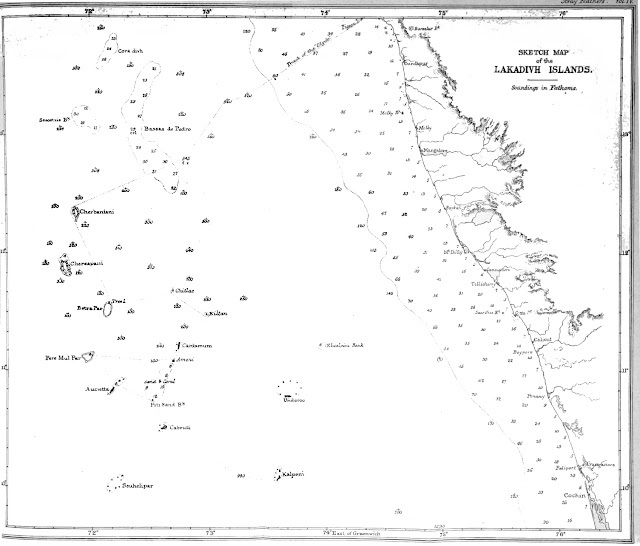 In 1873, a Marine Survey Department was established. The Department was headed by Commander A Dundas Taylor and included Staff Commander J.H. Ellis, RN as deputy superintendent. It also included Dr J. Armstrong as surgeon and naturalist. The marine surveys included as part of their study, the mapping of depths, and the examination of marine organisms as well. One of the early survey assignments for Commander Ellis was aboard the Clyde. In the General Report of the Operations of the Marine Survey of India from the Commencement in 1874, to the end of the official year 1875-76 by Dundas Taylor we read on page 7 that they had an unlikely passenger on board in 1875. 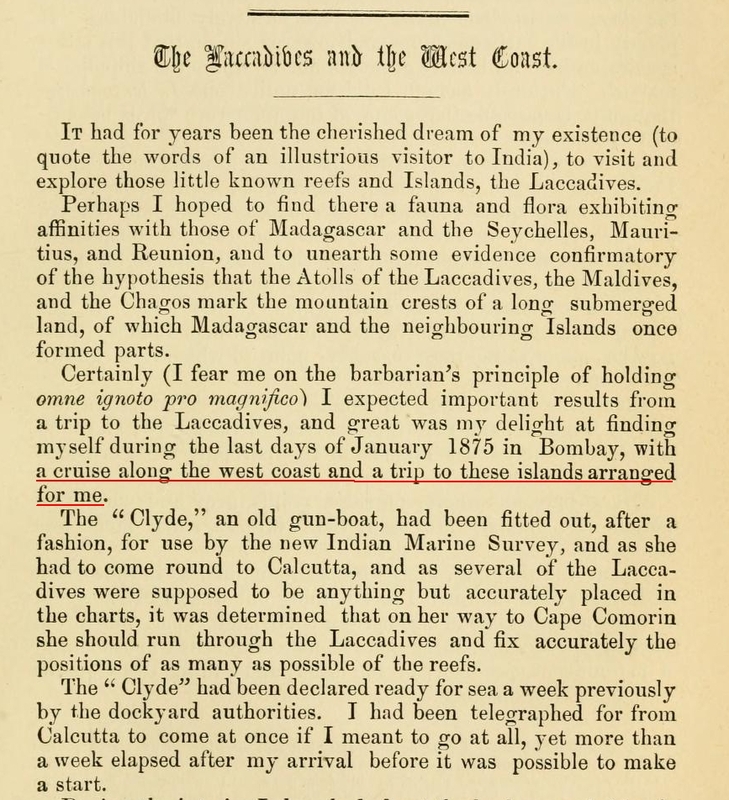 The whole thing about measuring a meridian distance between Pigeon Island and the Laccadives (Lakshadweep) and remaining there for a fortnight seems like a clever ploy initiated by Hume, the Secretary to the Government of India, to hijack the government machinery for his ornithology. One object that I had in view in making this trip was to ascertain whether or not the Laccadives were separated by a deep trough from India—a matter which up to this time had remained uncertain. I had, therefore, indented on the Bombay dockyard for deep sea line, and they supplied some five or six thousand fathoms of splendid looking line. Our Captain, an old Porcupine man, entered most cordially unto my views, and soon after we left Bombay, took the line in hand and began testing and marking it. To our dismay it soon appeared that the line was in many places rotten. Whilst we lay at Pigeon Island, the Captain had a lot of it carefully picked over, all bad pieces picked out and the good carefully spliced together. Hume's copy of Darwin's Origin of Species. Anyway, what this does make clear is that Hume would have read the work of Alfred Russel Wallace. Wallace's 1863 paper was communicated to the Royal Geographical Society by Clements Markham and Markham would have been closely associated with Hume during the course of the cinchona work under the aegis of his Department of Revenue, Agriculture and Commerce. Huxley had named it the "Wallace Line" in 1868. (Hume had of course read Darwin and Hume's copy of a first edition of The Origin of Species is at the South London Botanical Institute) Hume was also in touch with the geologists of the Geological Survey of India from the time of Stoliczka. Richard Lydekker had joined the GSI in 1874 and in 1879 Hume got him to write about the skeletal structures of birds based on his training in paleontology. Interestingly Lydekker found another now eponymous biogeographic delineation of Australia in 1895. At the end of the Laccadives trip report, Hume includes three bathymetric charts in this issue of Stray Feathers - of the Laccadives, Cherbaniani Reef and Kiltan Island. It is rather interesting considering that printing illustrations was so much of a problem in those times. He also spends considerable space in exploring the origin and geological structure of Betra-par - whether it has a rocky core or if it is entirely formed out of coral reefs. He had samples of the soil tested by the GSI. He collected molluscs that were identified by Nevill of the Indian Museum. Plant specimens were also collected and these were examined by David Prain. At last we made Tuticorin, and I had had enough of the old "Clyde," to which I here bade farewell, devoting the rest of my leave to Southern India, the Pulneys, and Neilgherries, of which I need say nothing here. I fancy that he would have visited his good collaborators S.B. Fairbank in the Palnis, Margaret Cockburn in Kotagiri, his collector W R Davison in Ootacamund, and his cousin Edward Balfour (who left India in 1876) in Madras before taking the train back towards Calcutta or Shimla. We tend to think of most of the colonial ornithologists as mere collectors making use of their presence in a particular location but these and other examples from Hume's work clearly indicate that he had underlying theories and sought to find evidence either in support or against them. This is especially useful as a lesson for beginner birdwatchers - Max Nicholson wrote in his Art of Birdwatching - "One cannot observe without a theory, and what seems the simplest of ornithological tasks - to go out of doors and look out for something worth recording- is in reality one of the hardest ... It is a mistake to imagine that complete impartiality and freedom from preconceived ideas is the qualification for the perfect observer. The cow has a remarkably open mind, yet it has never been found to reach a high degree of civilization." Ernst Mayr is supposed to have expressed a similar idea which Joseph Hickey recalled as "everybody's got to have a problem." Mayr expected even ordinary bird enthusiasts to have big biological questions at the backs of their mind so that they might make more critical observations. The idea of soundings and sea depth measurement to examine continental boundaries and thereby bio-geographical boundaries did not stop with Hume. He seems to have influenced his collector W R Davison as well. When Davison went on to take up a position at the Raffles Museum in Singapore (the Straits Settlement in those times), he decided on delineating his area of specimen collecting, which included numerous islands, using a cutoff at a distance where the sea floor depth exceeded 50 fathoms (Professor Kevin Tan of Singapore in his history of the Singapore museum has many biographical details on Davison including his tragic death - see Tan, 2015). (Actually posted as a message on the list - bngbirds on 30 Sept 2013) Hickey mentioned above was himself inspired by Nicholson and wrote a book called the Guide to Bird Watching as part of his Master's degree! This book inspired a Mrs M.D. 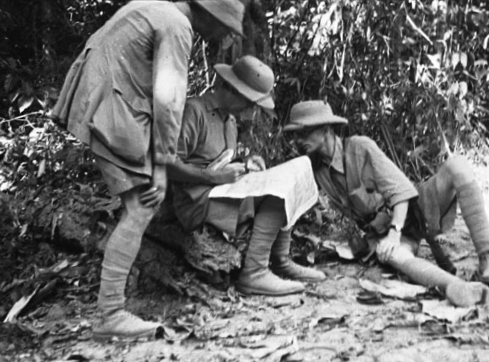 Wright, wife of a forest officer in India at Dehra Dun. She counted birds and wrote a remarkable piece in the Journal of the BNHS in 1949. She also influenced Dr Joseph George who conducted studies on drongo numbers and published many notes in the Indian Forester. Dr George went on to establish a lively group of bird-watchers in Bangalore. Interestingly, Salim Ali seems to have glorified the idea of the "unbiased observer". The debate around having paradigms or frameworks for observation has obviously taken place before and I would subscribe to the view of Goodin (2006) that allowing for a multiplicity of biases is more helpful that claiming to be unbiased, which really is a state that is unachievable. A truly unbiased person would be taking a random walk, never reaching any specific destination! George, J. (1957). Birds of New Forest. Indian Forester, 83(11):674-687. George, J. (1957). Birds of New forest. Indian Forester, 83(12):724-737. George, J. (1958). Bamboo Nestboxes. Indian Forester, 84(11):687-692. George, J. (1958). A Young Dark Grey Cuckoo-shrike. Indian Forester, 84(5):286-287. George, J. (1960). Tolerance of Birds to Ascu - and Creosote - Treated Nesting Sites. Indian Forester, 86(12):753-754. Goodin, Robert E. (2006) The Epistemic Benefits of Multiple Biased Observers. Episteme 3(3):166-174. Wright, M.D. (1949) A bird count in Dehra Dun. J. Bombay Nat. Hist. Soc. 48(3):570-571. Cushman, Joseph A. (1928) Foraminifera; their classification and economic use. Markham, Clements R. (1878) A Memoir on the Indian Surveys. London: W.H. Allen and Co.
Schmiedl, G., and D. C. Leuschner (2005), Oxygenation changes in the deep western Arabian Sea during the last 190,000 years: Productivity versus deepwater circulation, Paleoceanography, 20, PA2008, doi:10.1029/2004PA001044. Tan, Kevin Y.L. (2015) Of Whales and Dinosaurs: The Story of Singapore's Natural History Museum. Singapore: NUS Press. pp. 31, 40–48. Thomson, C. Wyville (1873) The Depths of the Sea. London: Macmillan and Co.
Wadia, Ruttonjee Ardeshir (1955) The Bombay Dockyard and the Wadia Master Builders. p. 302. All material on the site may be reused ethically. Not all material used is free of copyright. Simple theme. Theme images by gaffera. Powered by Blogger.